Paxiom offers the largest variety of packaging solutions all engineered to fit your production requirements and budgets. Among our several packaging technologies, two of which are designed to package products of many types, sizes, and weight. Our packaging solutions are the bagging and wrapping technologies wherein each contains their own product line of automatic packaging machines. Swifty Bagger is a family of automatic bag filling machines designed to automatically open, fill, and seal a wide range of pouches. It operates bag styles: 3 sided seal pouch, folded over pouch, stand up pouch, shaped pouch, and quad pouch. Available in three models. The Swifty Junior for rates up to 800 bags per hour. Swifty 1200 for larger bag size requirements of up to 1,800 bags per hour. Similarly, the Swify 3600 for speeds of up to 2,500 bags per hour. Bingo Bagger features intermittent sealing jaws and is engineered for filling larger bags whether it’s laminated or low-density polyethylene structures. It is best known for its unique ability to gas flush in order to increase the product’s shelf life and preserve its quality. VS Bagger is perfect for applications that do not need sealing. Even if it needs one, it can be easily integrated with any existing sealing machine. It can seal pouches of up to 14 inches wide and up to 20 inches long. Zippy Bagger has a maximum production speed of up to 35 bags per minute. It can operate even on laminated and low-density polyethylene materials. Most noteworthy is that it can fill stand up pouches, and pillow pouches with a re-closable zipper or carry handle. R2B Horizontal Form Fill & Seal Bagger produces, fills, and seals pouches in one automatic process. With the use of laminated stock film to create a variety of pouch styles, this HFS bagger eliminates the need to use pre-made pouches. Thus, reducing the material cost dramatically. VerTek Vertical Form Fill & Seal Series offers great flexibility and serviceability. It can produce vertical pouches or bags as wide as 24 inches effectively packaging a wide range of industries and products. This family of VFS machine is available in 4 models. VerTek 800 with a maximum pouch/bag width of 8”. VerTek 1200 for up to 12” wide. VerTek 1600 with up to 16 inches wide. Finally, the VerTek 2400 producing up to 24 inches wide pouches/bags. XPdius Elite i-130 is a vertical bagging machine with 2 servo motors capable of producing up to 100 bags per minute. As a result, it is designed with serviceability and high performance in mind. The Elite i-130 is built with a stainless steel frame, vacuum pull belts and hinged electrical enclosure. SleekWrapper is a brand of high-quality automatic flow wrapping machines that are known to effectively package various types and sizes of products. Also referred to as horizontal packaging machines, the SleekWrapper family consist of four models. For entry-level packaging requirements of up to 100 packages per minute, we have the SleekWrapper 40. The SleekWrapper 45 that is geared up towards a maximum speed of 150 packages per minute. If you’re looking for something that has higher mechanical rating than those two, then you can have our robust SleekWrapper 65 capable of wrapping up to 200 packages per minute. Finally we have the SleekWrapper Inverted, this one is specifically engineered to package hard to handle products like soft, sticky products and multipacks with a mechanical rating of up to 150 packages per minute. Breezy Bagger, also part of the SleekWrapper brand, this automatic packaging machine differentiates itself by combining both the horizontal wrapping and vertical bagging process in one compact machine. 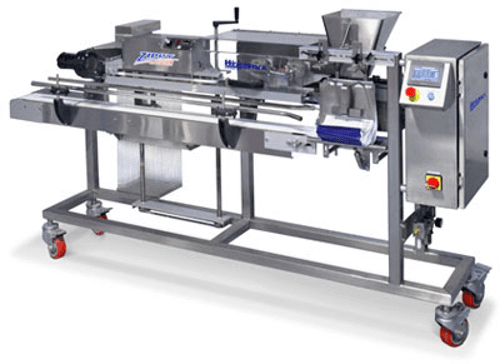 Consequently, it introduces a unique pivoting feature used in various applications like automatic bagging, product loading and over wrapping. Therefore, we have an automatic packaging machine to suit your production needs.